Caught up with Day 1 and Day 2? We started today with a quick and light breakfast at our hotel, this as we needed to save a lot of space for the later morning and afternoon. 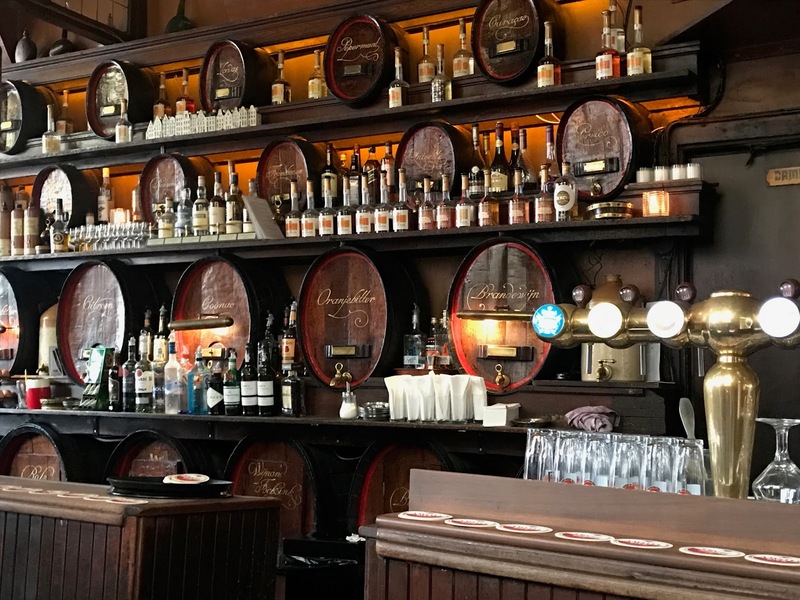 We went on The Hungry Birds Food Tour, a walking tour taking us to all of the best Dutch foods and best restaurants in Amsterdam. We’d be stopping by at 10 locations during the 4.5 hour period, covering everything from herring, fries, and ice cream. 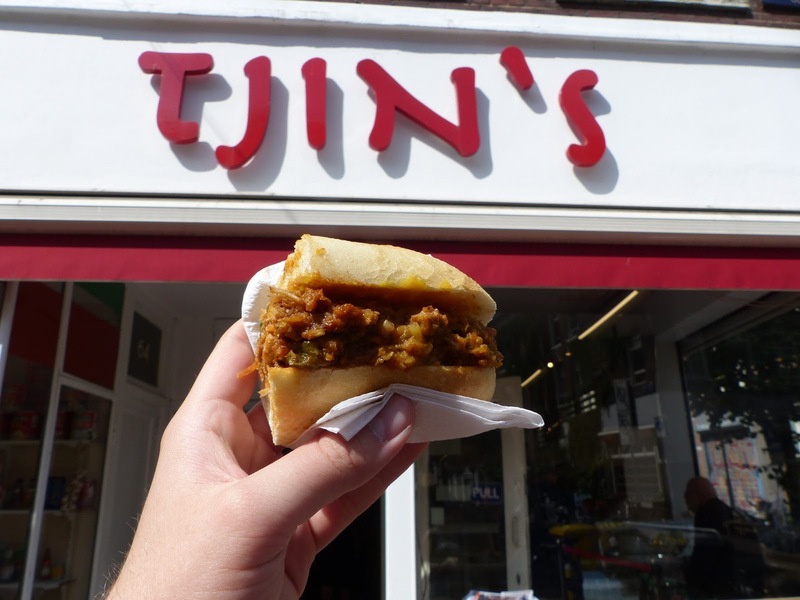 It all began at Tjins, a food store and specialist in serving up Surinamese dishes of the highest quality. We tried Pom, a delicious and spicy sandwich with so many different ingredients. All of these would normally be served separately or in other dishes, but the Surinamese found a way to mash them all together, and put it into a sandwich for people who need something on the go. The hot sauce in there was top notch and it was a lot of flavour for 10.30 in the morning… in a good way of course! We then moved through Albert Cuyp street market which was full of souvenirs, clothing and fantastic food. Our next two food stops took place along this road, both very different but equally as great! 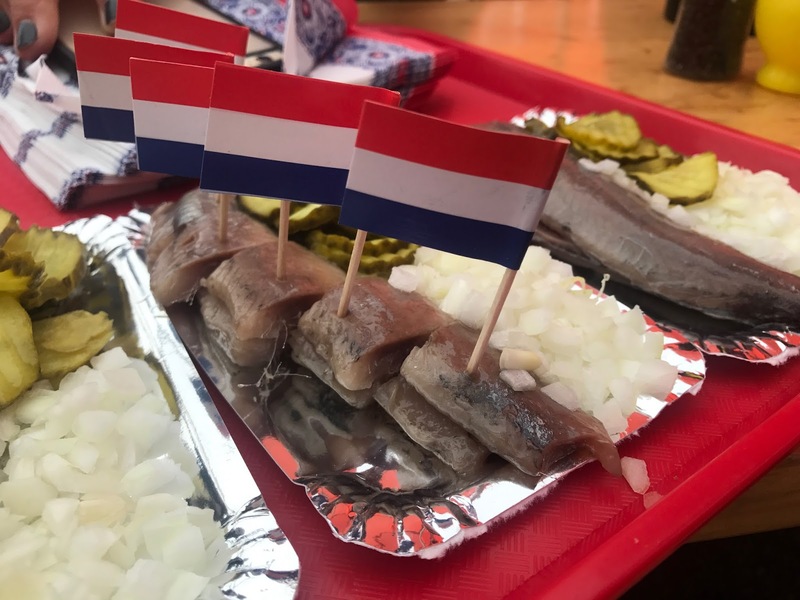 Our first was at a fishmongers, who put together herring with pickles, and kibbeling. 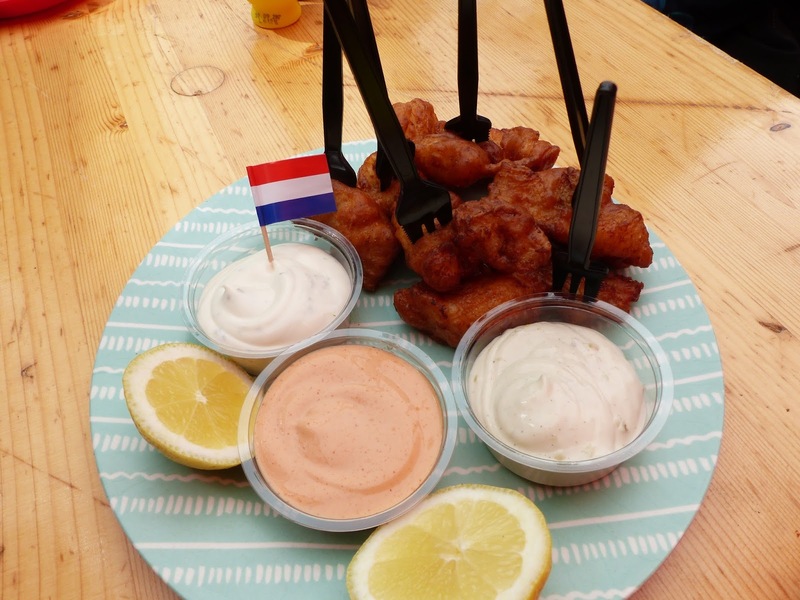 This is a common dutch snack consisting of lightly battered fish and garlic mayonnaise and tartar. Both were amazingly fresh and tasty, and we wish we’d taken the option to eat a whole herring by the tail! Absolutely delicious. Stroopwafels are perhaps a more famous Dutch snack, and Jessica has been so excited to have big and fresh ones of theses since being given some by our Air Bnb hosts on the first day here. This place is renowned for being the best, as most nowadays have adapted the recipe to include a lot more caramel than was in the original. Freshly made in front of us, just having it warm made everything so much better! Next up was some drinks, and we stopped off at Cafe Bouwman for a sample of three jenevers. I, James had one that was young and similar in taste to vodka and tequila. The second option was older and likened to whiskey, and Jessica’s choice had berry flavouring. This one was launched to introduce women to these types of drinks, as traditionally only men drank jenever. 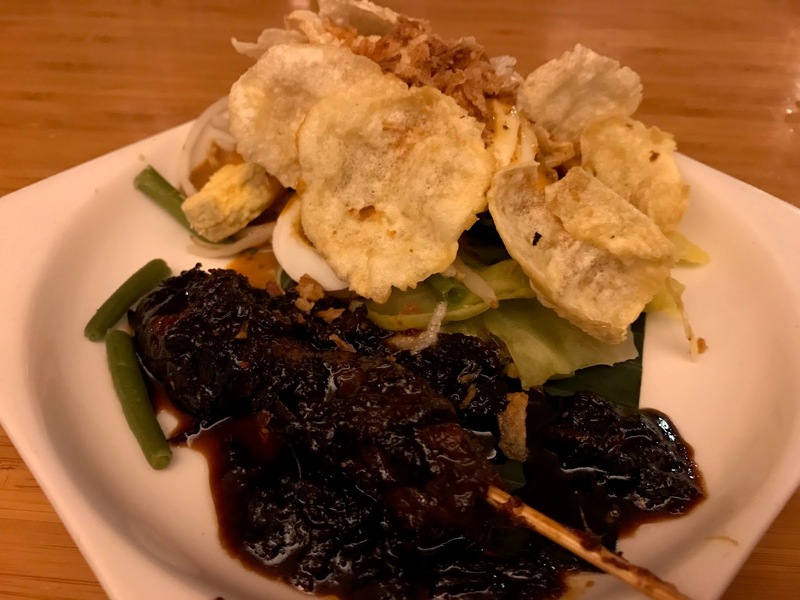 Believe it or not, by this point our appetite had built back up again and we were taken into Sempurina, the best Indonesian restaurant in Amsterdam. Our host Esther is from here so was able to tell us all about the history of their food culture, and where this dish of skewers with a salad and boiled egg fit in. We followed this up with something similar to what we ate on the first day here. Oorlog is the signature sauce to have with your fries, however since we had already them, it was recommended that the samurai sauce is equally as delicious! They were spicy and full of flavour, and these fries were so soft on the inside and crispy on the out. Perfect! 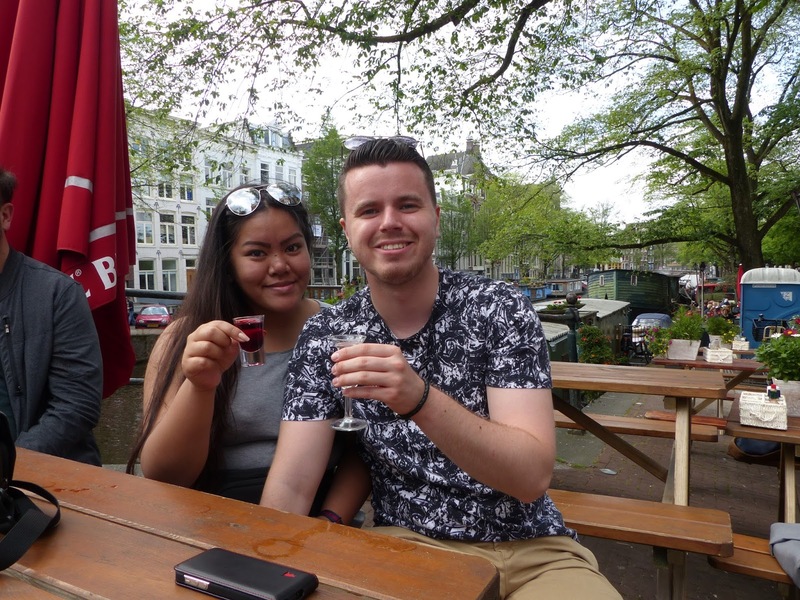 We took quite a while to relax and try out many different cheeses at The Dutch Delicacy. This shop looks absolutely amazing, with so many different cheeses and devices to help you cook, cut and melt your cheese. We tried every type on offer to us, from goats cheese to a beer flavoured cheese. Whilst still in the cheese shop, Esther went to pick up her order of chocolate cookies from around the corner at Van Stapele. This is owned by someone who believed she had the perfect recipe for a chocolate cookie, and set up a store selling that one cookie only. 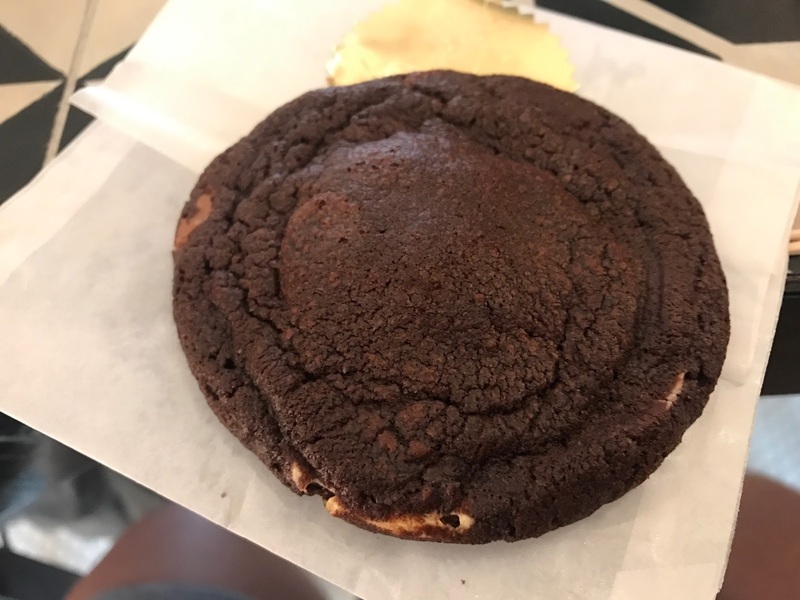 Despite being told by others to develop her range and take her talents further, she refuses and wants to be known as the best chocolate cookie maker. 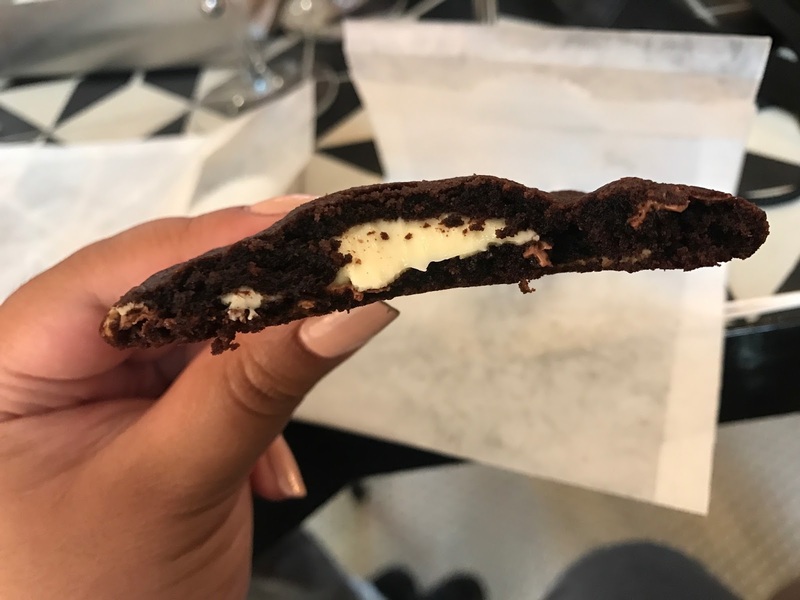 We can confirm it is the best chocolate cookie we have ever had! Our final dessert stop was at Lanskroom Cafe, known for their gigantic stroopwafels! 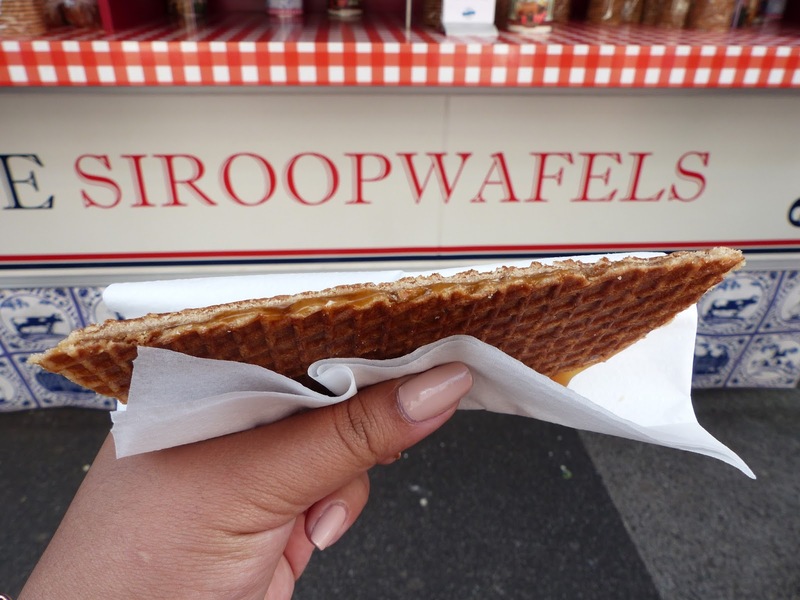 However they have recently started making ice cream, with the option of a mini stroopwafel to stick on top and use to scoop the ice cream and eat together. 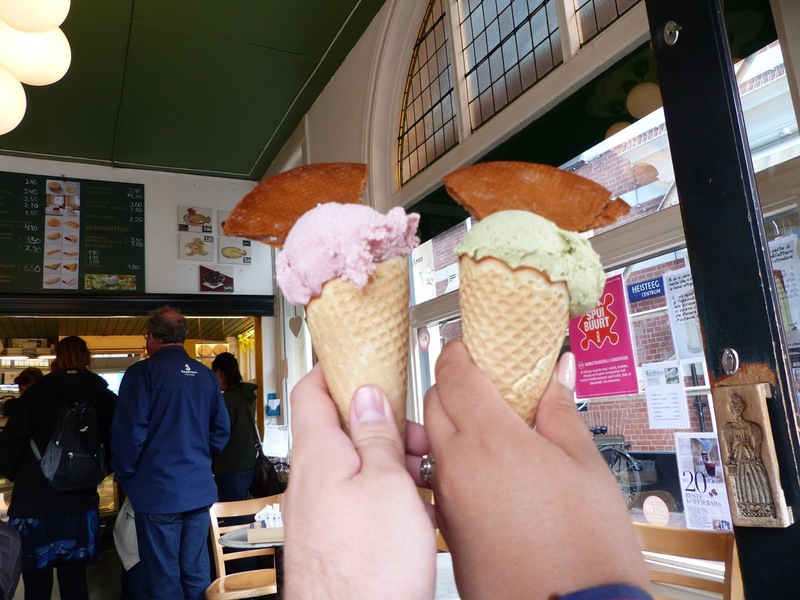 Both going for our favourite flavours of pistachio and strawberry, it was a fantastic way to end the food tour. However, it wasn’t the end. We had the option to join everyone in the most historical brown bar just over the road. We ended with a drink of our choice, and said our goodbyes to our friends made on the tour, and our fantastic Mother Bird Esther. Every single food and drink we had on the tour was so delicious in it’s own way. 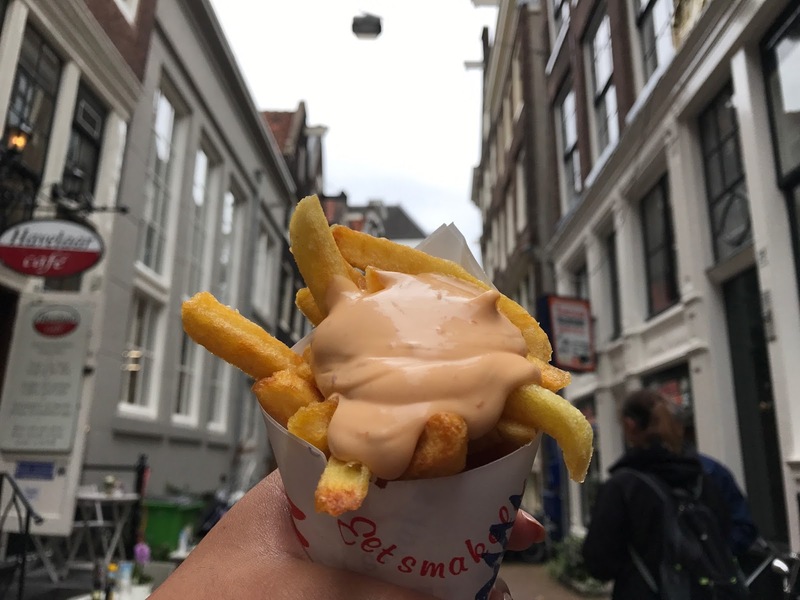 As foodies, we believe this is the best way to tour the city and it makes us so excited to join others whilst on our trip around Europe! Thank you so much to Hungry Birds for this fantastic today! 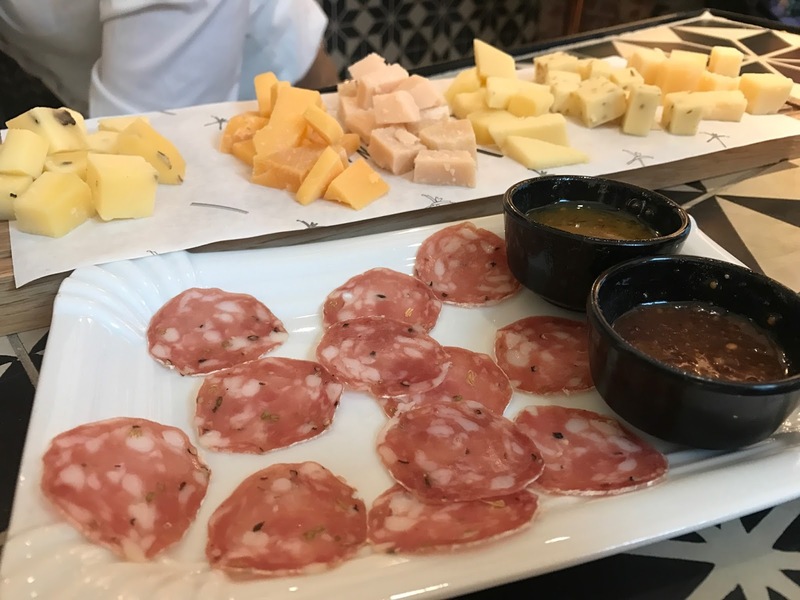 Disclaimer: we were given discounted tickets to the Hungry Birds food tour in exchange for a mention in this blog post and coverage on social media. However as always, all pictures and views are our own. Oh my the food look incredible! I'm a huge foodie so this is like my dream post. Adding Amsterdam to my list. Hope your having a great time. Oh my gosh, all of that food looks absolutely amazingly delicious!!! I am starving now, haha! I recognized stroop waffles, since I've had the packaged variety, but I do love them. So good! Everything else looks divine! I'd like to go on a little food tour now. That's my kind of tour!Ashlynn | The Crimson Cardigan"
All of this food looks like my perfect choices! I love the look of the cookies and the meat and cheese platters. I've just eaten my dinner and you're making me hungry again! We went for the samurai sauce too, it was spicy but yummy! The chips were great!